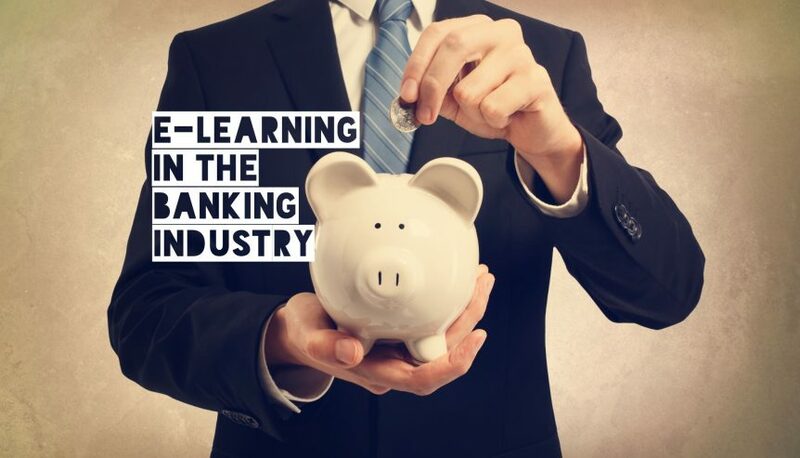 When you look globally, the banking industry is ahead of many others in its adoption of e-learning. I have always thought banks and financial services companies could go even further, though, replacing or enhancing the instructor-led courses that still exist with e-learning courses or e-learning elements. Compliance training – complying with regulators is crucial to your business with training being one of the most important parts of the compliance process. E-learning can make that training more efficient. Process training – e-learning can help when you are implementing new processes, for onboarding, and for upskilling your existing team. E-learning can save you money and time when doing this training, plus the modular nature of e-learning is beneficial. By creating an e-learning course in modules, you can easily update specific sections when processes change. In addition, you can create core modules for the course and then variable modules to make the content more specific to individuals in your team with different roles. Soft skills training – soft skills are very important for many of the roles in your bank. This includes improving the way your staff deal with customers as well as improving the performance and inter-personal dynamics of teams. Software training – this can include training existing staff when you introduce new applications as well as during the onboarding process. E-learning is also ideal when upskilling staff so they can become proficient on software they haven’t used before. Sales and customer service training – to improve the customer experience and to help your bank win more business. With e-learning, you can ensure standards remain high in terms of performance and in transparency and accountability. Onboarding training – I have already mentioned some aspects of onboarding above. In addition, e-learning can help with the entire onboarding process. In particular, using e-learning ensures all new members of staff get the same onboarding experience plus they can use the e-learning course as a tool for future reference. From my experience, many banks recognise at least some of the opportunities e-learning presents. There are barriers, though. Understanding those barriers and overcoming them is crucial if the banking and financial services industries are to realise the full potential that e-learning offers. Expertise and quality design – in most situations, you can only have one. For example, it is possible to get e-learning courses with great designs that look modern and have modern features that will engage your learners. It is very rare, however, to have specialist banking expertise in the production of those courses. On the flip side, courses produced by those with banking industry experience rarely have input from skilled designers and training professionals. Too generic – decent quality e-learning courses for the banking industry are available off-the-shelf. However, they are usually restricted to specific topics such as compliance. In addition, they are not customised to your company so don’t take into account the internal structure, processes, priorities, or personalities in your bank. Ongoing costs – finally, many e-learning solutions aimed at banks include ongoing license fees. This can be a challenge when managing a training budget in your company. Apply e-learning across a broader range of training topics. There are several strategies you can use to achieve this including using synchronous course structures or a blended classroom approach. Ensure the e-learning provider has banking knowledge particularly in relation to compliance training. That knowledge should be of banking in the MENA region and ideally be country specific. Make sure the provider fully customises your e-learning course to make it as relevant to your employees as possible. This will increase learner engagement and give you a greater return on investment. Insist on a full license arrangement so you can use the e-learning course on a continuing basis. It is possible to achieve all these objectives – our banking industry offering at Capytech, for example, includes all the above. The banking industry continues to go through a period of change. The drivers for this change include new technologies like machine learning and big data analysis. It is also being driven by customer demand as well as the changing demands and priorities of regulators. When it is fit-for-purpose, agile, cost-effective, and results-focused, e-learning can help keep your bank compliant and competitive.